As much as I dislike coming home in the dark when it’s only 5 PM, I have to admit that the low sun does bring gifts with the early nightfall. From 2 o’clock on, certain parts of the garden are lit in ways that spotlight particular plants. The red twig dogwoods in the rain garden are never given the same illumination in the summer, for example. And the sunsets? Well, all I can say is that the evening sky is often so colorful that I wonder why there aren’t car crashes right and left at this time of day…it’s hard to focus on the road when such splendor is going on up above. Winter light is another reminder that there are two sides to every coin and that difficulties often come with gifts. But I’m wondering if there is something more for us to take away from the light at this time of year. Maybe it’s a lesson about the value of altering perspectives. As the sun moves lower in the sky we’re presented with colors and views that force us to look again, with new eyes. Or perhaps I am looking too hard. Could it be that winter’s spotlight is merely asking me to stand in the garden on this last day of November and truly see what’s in front of me. 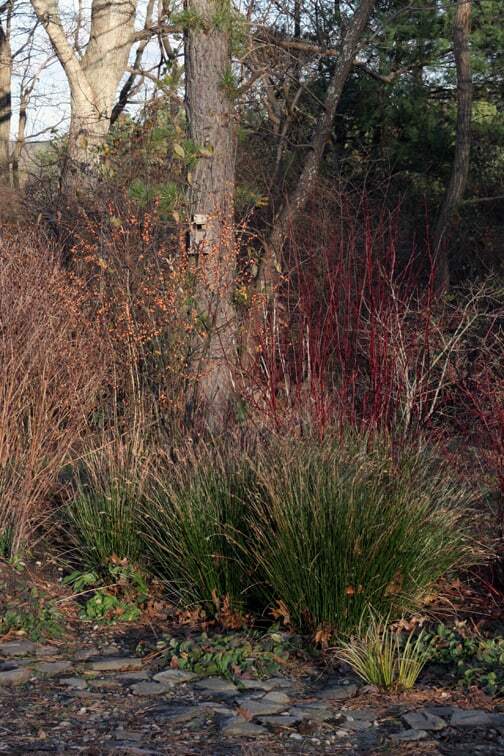 Maybe it's just that: Red twig dogwood, ‘Winter Gold’ winterberry holly, and Juncus, all illuminated in the late-afternoon sun.